This page is a continuously updated list of information security resources that any information security team member should be aware off. You can contribute to the list by emailing Sieuwert van Otterloo (sieuwert @ ictinstitute.nl). SANS Institute and the center for internet security joined forces with the US government to create a list of cybersecurity best practices that are most effective. The list is currently in version 6.1 and contains many useful best practices, ranging from firewalls to secure development. The International Standards Organisations ISO maintains thousands of standards, from very general ‘quality standards’ to very specific technical standards for watches or railways. 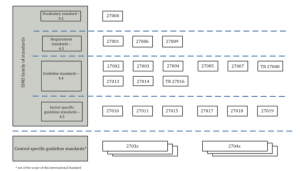 The ISO 27000 series (wikipedia) is a series of standards that address information security. The first document, ISO 27000, provides basic definitions of security terms. ISO 27001 provides the criteria of a good information security management system, similar to the Security Verified general requirements. ISO 27002 is a list of best practices applicable to most organisations. They are not officially mandatory, but in practice organisations that want to get certified should check all of these controls carefully and consider implementing them. ISO27000 can be downloaded free of charge here. The other standards should be bought from ISO or a national standards body such as BSI or NEN. 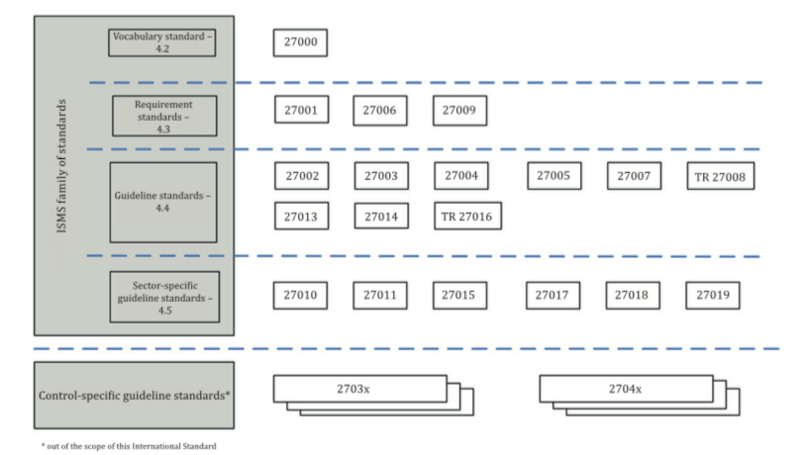 The image on the right provides a quick overview of the role of all standards in the family (source: ISO27001. The Open Web Application Security Project is an initiative to share information on securing internet-connected systems. The initiative was started in 2001 and is most famous for its publication of the OWASP Top 10, a lits of the ten most vulnerabilities in Internet applications. The OWASP foundation also offers many other resources, such as cheat sheets for developers. The OWASP top 10 is often used as a standard for security tests: any system offered on the Internet should at least be designed to not contain these common vulnerabilities. CWE/SANS maintains a similar list, called the Top 25 most dangerous software errors. PCI-DSS stands for Payment Card Industry Data Security Standards. It is an initiative by the major banks and credit card providers to increase card data security. Officially the standard is only created for organisations handling credit card data, but the PCI-DSS information is freely available and can be used by other organisations as well. A very useful starting point is the PCI-DSS quick reference guide available here. The National Vulnerability Database is the largest internet database of known weaknesses in software products. It can be used for checking whether older versions of products are still secure. Krebs on security is a blog by information security researcher Brian Krebs. The Dutch National Cyber Security Center publishes security advisories for any serious vulnerability. If you are using a common webserver or CMS, you should probably subscribe to the security updates for the product. Check here for wordpress, joomla, drupal, apache. It is in some case required for information security team members to join the security community. Below is a non-exhaustive list of available organisations. The IAPP (International Association of Privacy Professionals) is a US-based organisation with local chapters. The following companies develop products or services for increasing information security. If you have the basics in place, you can evaluate these solutions and check whether they address any major risks that your organisation faces. Zerocopter provides a continuous security testing platform, powered partially by scanners and partially by a market place model and real testers. HackerOne is a bugbounty platform. Any organisation can ask ethical hackers to try and find vulnerabilities, and only pays researchers on actual vulnerabilities found. The following organisations can conduct ISO27001 audits. If you are considering an ISO27001 audit but are not sure whether you qualify, you can ask ICT Institute to conduct a pre-audit review. We can quickly check whether you have the basic elements in place using our information security review process, and help you become audit-ready. Integraal Veilig (in Dutch) is an initiative to promote cyber security for Dutch higher education institutes. Privacyverified.nl is an initiative by ICTrecht, a Dutch legal firm. It is a standard for checking whether organisations comply to Dutch privacy laws. There is no relation between Privacyverified and Security Verified. Many Dutch IT lawyers specialise in giving good advice on compliance with personal data protection laws and can help with providing the right terms and conditions. Check our overview of IT lawyers in The Netherlands for a list of such lawyers. The UK gambling commission has published security audit advice, outline how gambling companies should execute their security audits.